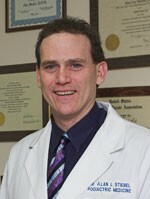 Dr. Stiebel graduated from the University of Michigan, Ann Arbor Campus, and the Scholl College of Podiatric Medicine. He completed his preseptorship in conjunction with the Dearborn Medical Center Hospital. He is a member of both the Michigan and American Podiatric Medical Association, as well as a diplomat of the American Board of Podiatric Surgery and a fellow of the American College of Foot and Ankle Surgeons. He is affiliated with St. John Macomb Surgery Center. Dr. Stiebel has lectured on podiatric conditions in the United States and overseas. Dr. Stiebel participates in all aspects of podiatric medicine and performs podiatric surgeries. He especially enjoys evaluating foot mechanics and structure, yet is also motivated by challenging surgical cases. Dr. Stiebel has been treating patients in Macomb County since 1984. Dr. Butler is a graduate of the University of Toledo and the Ohio College of Podiatric Medicine in Cleveland. He completed a two-year residency at St. John Hospital Macomb Center, which specializes in reconstructive surgery of the foot and ankle. Dr. Butler is a member of both the Michigan and American Podiatric Medical Associations. He is a diplomat of the American Board of Podiatric Surgery and a fellow of the American College of Foot and Ankle Surgeons. He is affiliated with St. John Macomb Surgery Center, Troy Beaumont/Macomb Beaumont Surgery Center, and Henry Ford Macomb Hospital. Dr. Butler has provided numerous informative lectures on podiatric medicine and surgery. Dr. Butler enjoys all phases of podiatric medicine, but his special interests are pediatric and sports-related foot and ankle problems. He also performs podiatric surgeries. 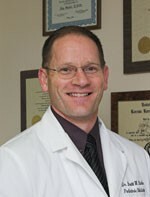 Dr. Butler has been treating patients in the Macomb area since 1993.